Rick Darke’s keynote speech at last week’s FNPS Conference was a richly layered presentation beautifully illustrated with photographs that delivered. He arrived at the conference early so he could go on one of the field trips and incorporate local information and pictures, like the one on the right. 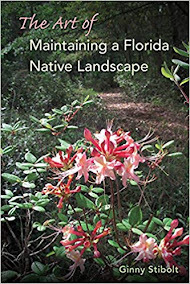 His talk, “Liveable Florida: Native by Design," included ideas for designing in gardens, but extended beyond garden borders to suggest designs, or plans, that contribute to a more sustainable world. What was All that BUZZZZ at the FNPS Conference? ﻿﻿Bees! We learned a lot about Native Bees from two fabulous presentations and a BEE Movie. On Friday during lunch, Tracy McCommon, of Nature Wise TV, screened their video “Gardening for Native Pollinators of Florida,” which was so popular that they ran it again the next day. It’s for sale on their website, if you’d like a copy. Friday afternoon Stephen L. Buchmann, author of “The Forgotten Pollinators,” gave his presentation, “Trouble in Paradise: Are we Losing our Native Bees? 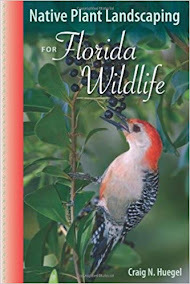 Then on Saturday Akers Pence: “Restoring Native Pollinators Habitat: Native Bees in the Landscape.” Here’s a link to Akers’ work at the University of Florida. 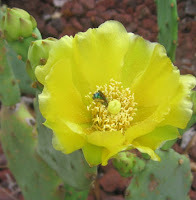 · Most of the native bees are solitary and shy. Wekiwa Springs State Park has a beautiful spring and river to canoe. But it is the diversity of habitats and rare plants that draws FNPS folks to the park. 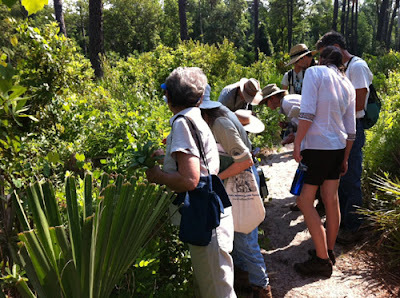 On the Sunday field trip associated with the 2011 Conference, a group of avid botanists enjoyed this diversity. Learning new plants and challenging oneself with identification is great fun. Seeing how the plants fit into this diversity of habitats makes it even better! It's like being a kid in a candy store! There are tons of native plants on sale at the Conference today, plus the chance to talk to knowledgeable growers for advice. A real treat! We usually feature plants here, but I thought you might like to meet the people behind the plants, and hear a little of what they had to say. Sharon Dolan, left, of Maple Street Natives in Melbourne, said that people were looking for plants that were drought tolerant and cold tolerant. She has been selling a lot of Adam's needle and Asclepias tuberosa. She's holding starry rosinweed, another big seller. 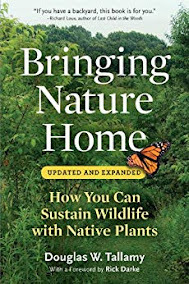 Her husband, Brent, enjoyed going in and hearing some of the presentations yesterday, especially Stephen Buchmann's talk 'Trouble in Paradise: Are We Loosing Our Native Bees?' Brent appreciated the fact that Stephen was so personable and he was able to go up and ask questions after the talk. I went to that one, too, and learned so much. You'll be hearing more later on topic! The 31st Annual Conference is definitely off with a bang! Plant enthusiasts from all over the state have been arriving since yesterday, and excitement is in the air. Both the Florida Native Plant Society and the Florida Exotic Pest Plant Council are holding events here at the Sheraton Orlando North Hotel this weekend. You wouldn't think a group like this would like weeds, would you? But in fact, The Weeds are rockin' and rollin' tonight with no control measures anywhere in sight! The music is providing a backdrop for six authors who are signing books and talking with people about ideas near and dear to their hearts. The brave and knowledgeable are attempting to win a new contest instituted this year - Invasive Plant ID. Everywhere throughout the hotel friends are re-connecting, and new acquaintances are exchanging emails as new bonds are formed. Conference week is here! Online registration is closed, but you can still attend by signing up onsite in Maitland! Space is available, and you can sign up right at theSheraton Orlando North Hotel in Maitland, where the FNPS 31st Annual Conference will be held. You can come for one or both days of the speakers, programs and workshops that will be presented on Friday and Saturday. Plus the vendors, social events, author book signing, native plant sale and Serious Sessions of Plant Jeopardy add to the fun! 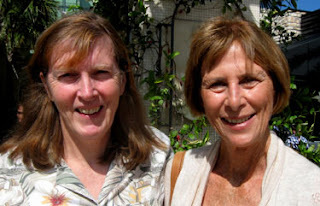 Listen to Ginny's FNPS conference podcast. As a garden writer, I've ended up on an email list for garden PR people. Most of the material is lame: "Here's an article so & so wrote and we think you should repost it on YOUR website or blog..." blah blah boring. 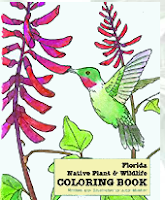 "Hello!Here's a cool video on flowers and native plants for Florida"
Here’s a neat video on Florida plants and flowers with great tips on drought tolerant plants and flowers that thrive in Florida’s hot, humid climate and add gorgeous color year-round to any landscape. Plus, for folks who want to attract butterflies to their garden, this quick and lively video will show how to create a beautiful butterfly garden that’s eye-catching and good for wildlife. 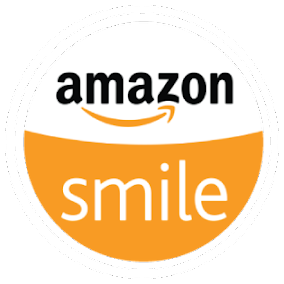 Many thanks!" 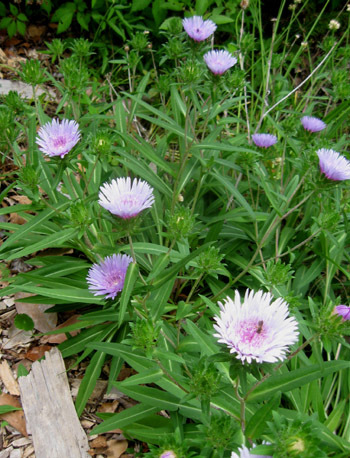 ﻿Stokes aster (Stokesia laevis), an herbaceous perennial, is native to northern Florida and has been collected in the wild in a few scattered counties in north Florida as shown in this profile on the Atlas of Florida’s Vascular Plants: www.florida.plantatlas.usf.edu/Plant.aspx?id=816. 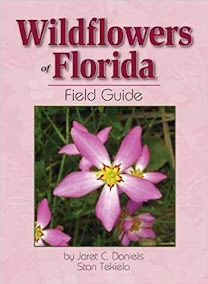 It will also grow well farther south throughout central and into parts of south Florida. Normally it’s a lovely lavender, but some varieties are blue, white or pinkish. Boy, does it attract small native bees and various butterflies! If the sun is shining, the flowers are covered with insects looking for its nectar. 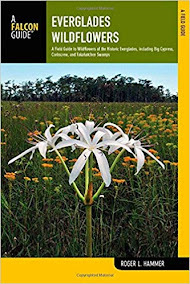 The Florida Native Plant Society may not have coffers as deep as the Federal Reserve, but it DOES have a collective depth of knowledge that not only makes it wealthy, but also gives it the ability to lend out to others. One place that is a repository for some of that wealth is the FNPS.org website. And good news: the information there is free for the taking, no applications needed, no interest charged. 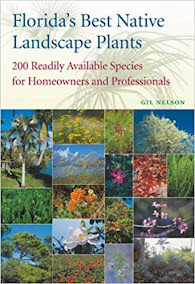 a clickable map listing plants that grow in your county? 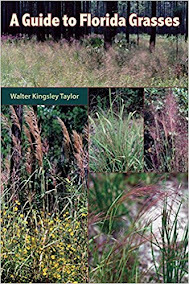 meaty information on what FNPS does state-wide?a fantastic children's coloring book of native plants and animals?instructions on how to make a butterfly garden?great printable summaries of how to plant for wildlife and how to use bunch grasses? All of these (which make great handouts for outreach events by the way), and much, much more are at your fingertips from the homepage. The Shingle Creek Regional Park, offering a unique blend of nature and history, sits quietly hidden within an urban area near Orlando. At close to 1,000 acres, the park has plenty of space to allow visitors to experience vivid encounters with a wild and vanishing Florida, and to take a look back a site where pioneer families lived and worked long ago. The agricultural history of Kissimmee began here in the late 1800s, and the park is home to some restored work buildings dating from that time. As you canoe down Shingle creek, you can experience unique beauty that has changed little since those days. You may see river otters, yellow-bellied slider turtles, deer, and gopher tortoises. For birders, the list includes limpkin, swallowtail kites, hawks, osprey, bald eagles, (an active nest at the moment! ), kestrel, owls, bluebirds and many more.